The ‘Waste Less’ chair by Architecture Uncomfortable Workshop is a unique and modern chair that employs timber offcuts recovered after structural beams have been carved out of whole logs. The simple sections of the log are joined by elementary yet strong iron clamps, thus traversing the complexity of ‘modern’ structural designs. The unadorned form also alludes to the easily accessible, as well as the naturalized, essence of the furniture. Functionally, the sections sort of “open up” to transform the log into the physical entity of a chair. This transformation process can be achieved manually by the user on removing the clamps, and then adjusting the position of the sections. In this regard, the final chair can be of two types — a conventional chair with leg rest or a rocking chair. 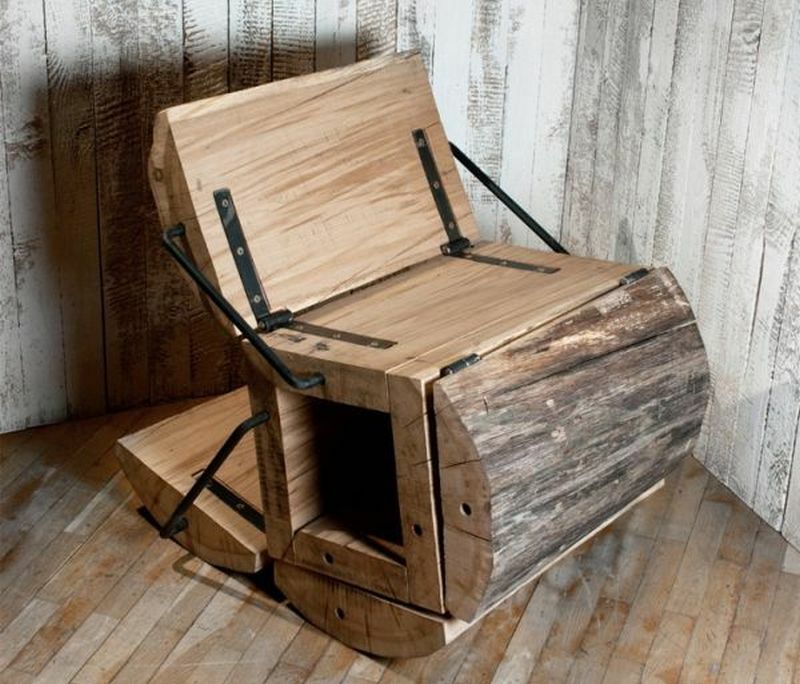 The ‘Waste Less’ chair by Architecture Uncomfortable Workshop is a unique and modern chair that employs timber offcuts recovered after structural beams have been carved out of whole logs. The simple sections of the log are joined by elementary yet strong iron clamps, thus traversing the complexity of ‘modern’ structural designs. The unadorned form also alludes to the easily accessible, as well as the naturalized, essence of the furniture. Functionally, the sections sort of "open up" to transform the log into the physical entity of a chair. This transformation process can be achieved manually by the user on removing the clamps, and then adjusting the position of the sections. In this regard, the final chair can be of two types — a conventional chair with leg rest or a rocking chair.